This is skilled, specialized technical work involved in the operation, inspection, maintenance, repair and installation of stage audio / visual equipment. An incumbent plans, coordinates, operates and supervises crews working with in-house AV systems, as well as overseeing contractors providing sound and video services. In addition, the incumbent provides technical advice to lessees, organization representatives and theatre management in order to ensure optimum presentation of events and activities involving the theatres’ systems, imported systems or a combination of both. An incumbent of this class exercises a high degree of independence of action and judgment in all related technical work including planning, advising, and supervision of crews. Work performance is reviewed by a superior in terms of effectiveness of services provided to the theatre and to lessees. The incumbent will be working in all VCT venues. •Evaluates systems, equipment and fixtures with respect to operational demands and develops with supervisor, annual maintenance, repair, overhaul, replacement and upgrade plans and schedules. •Performs and/or supervises maintenance, repairs, overhauls, installations and upgrades. Executes the proper storage and security of equipment. •Provides internal and external users with a variety of advice and assistance on matters related to presenting events at the theatres. This work may include creating or adapting sound and video designs as well as temporary system (rental) designs, temporary distribution systems, etc. •Plans, coordinates and supervises event installations and operations; operates complex computerized and/or manual control systems and other equipment as required by the event. •Supervises and coordinates the work of crews assigned, trains new and unfamiliar crew members and provides leadership in establishing high standards of operating efficiency, safe work practices and customer service. •Assists other stage and/or theatre departments where required. •Researches and provides information for budget submissions. •Checks, maintains, orders and replaces stock and equipment and prepares and maintains records of work performed. •Completion of two-year college-level technical diploma or the equivalent, and at least three years full-time experience at an equivalent level of responsibility in the core area of work following completion of post-secondary education. •Thorough knowledge of the methods, practices, techniques, electrical systems, equipment, fixtures, tools and materials utilized in the provision of AV services in theatre complexes. •Considerable knowledge of the hazards and proper safety precautions required. •Sound knowledge of all applicable collective agreements, codes, regulations, policies and operating procedures governing the work performed. •Ability to perform skilled maintenance and repair work on the equipment, fixtures and systems listed above. •Ability to work from plans, drawings and sketches. •Ability to meet, communicate effectively with and assist internal and external customers in achieving their objectives, and interact in a positive manner with a diverse clientele. •Ability to effectively lead and supervise the work of large crews under demanding and pressured conditions; ability to work to deadlines and with irregular schedules. •Ability to prepare and maintain records, material and equipment estimates and order same as required. 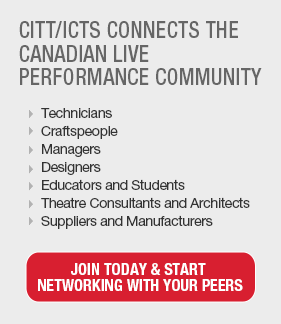 •Skilled in the use of the variety of tools, equipment, materials and systems involved in stage productions. •Ability to perform all duties to a high standard and be able to support the needs of the customer with minimal supervision. •Portrays a polished, professional image.